Riviera Maya hotels are your perfect stop for your next breathtaking vacation!!! This unique coastal area in Mexico on the Yucatan Peninsula and south of Cancun is a one of a kind area with white sand beaches, that will take your breath away and is perfect for your Mexico Vacation! How do I know? Well it's my favorite place to vacation! I've been numerous times and counting. This unique beach hotel and resort area is perfect for your honeymoon, romantic getaway, family vacations, or just a nice vacation on the Caribbean! There are not many unique areas in the World that have lots of all inclusive beach resorts, but the coast of Mexico is booming with brand new resorts monthly and this makes this beach area unique and offers the best in Caribbean vacations for a good price. All inclusive hotels and resorts are not the only type of hotel in the Riviera Maya. There are lots of smaller, personal boutique hotels, luxurious high class hotels and other accomodations that are not all inclusive resorts. It just depends on your preference. Whatever you are looking for, you can find it here on the Caribbean Sea! The Yucatan Peninsula is really soaring with new Riviera Maya hotels and resort properties and unbelievable ocean views! Whether you have visited before, or your a regular to the Caribbean Sea here at the Riviera Maya, you are sure you be hooked! There is beauty like none other when you experience the sound of the oceanwaves, breeze of the warm ocean and sounds of the tropical birds. You may just find it to be your new home. There are a few small towns in the Riviera Maya such as Playa del Carmen and Puerto Morelos that offer a full authentic Mexican shopping experience and yummy restaurants(you can even eat in a Tree House!) even some American ones like Burger King and McDonald's. Cozumel is only a short ferry ride away!!! Your only a short car ride to Cancun if the party scene is what you want. 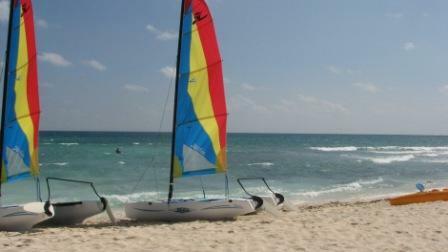 There are endless activities available through excusions in Riviera Maya Mexico. You can swim with the dolphins, drive ATV's, snorkel in cenotes or scuba dive, hang out at one of the all inclusive resorts and lots and lots more!! Having been to this area numerous times, I have found the good and the best in Riviera Maya hotels and resorts. This is your vacation...where you will be staying for the next 5 days or one month...or eventually move here. So you want to find the best hotel for you! Riviera Maya hotels and resorts are among some of the finest in the world!!! This website will help you find which ones fit you best and your budget. Not to mention, when is the best time to go, what items you need to bring to your hotel or items you might not have thought of. You will be well equiped for your vacation! I'm always updating this so you will always have the most up to date information! Start practicing your Spanish, and exchange your money, because your on your way to a beautiful vacation in the Mexican Caribbean! Grab a cup of coffee and stay a while as you read all about the different Honeymoons, Family vacations, hotels and travel hints and everything you need to know before your vacation! Adult vacations at All Inclusive Resorts are just what you are looking for. Luxury Hotels in the Riviera Maya that are 5 star! All inclusive resorts and what is really included. Honeymoons in the Riviera Maya Mexico. Weather information for your trip to the Riviera Maya Mexico. Travel resources that provide what your looking for. Travel Advice and tips to make your trip a breeze! About Me: Information on the creator of this website. The Riviera Maya Blog keeps you up-to-date with all additions to the Riviera Maya website and any upcoming events in the Riviera Maya Mexico. Subscribe by clicking on the orange RSS button.